3. In case you haven't set up your Samsung account yet, touch Sign in and then type in your Samsung account information. If you've already set up you Samsung account, touch Get started instead. 1. Get to your computer and browse this site: link.samsung.com. 2. Type in the username and password for your Samsung Account. 3. Click Sign In to continue. 4. Click Start to download and install the Samsung Link application. 5. Wait until the setup process is finished. Once done, click Registering your PC to use this computer with Samsung Link. Please note that the app is only available for computers running Windows OS. By default, this folder (directory path) will be created and shared: C:\Users\(username)\Samsung Link. 6. Click Settings, then select Add a folder if you want to share additional folders. 3. Touch the Menu icon to view the registered device and storage screen. 4. Select the mobile device or PC you want to access. You'll see the available devices are shown in white font. 5. Use the tabs at the upper portion of the screen to browse contents from Photo, Music, Video, Document and Files. 6. Touch to select a file and begin viewing or playback. 1. 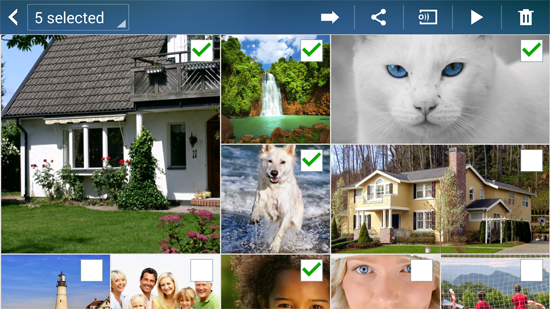 Touch Selection Mode represented by a box hovered with check on the upper-right of each file. 2. Mark the content you want to download, share or manage. 3. Choose one of the following options at the upper portion of the screen (location may vary depending on selected content). Option to send selected files to one of your registered devices. Option to download and share the content via Bluetooth, Gmail, Email, Messages or Wi-Direct. Option to share the content with a DLNA enabled device. Option to play selected files on your device. Option to delete selected files from their original location. 4. To access additional options when in portrait mode, touch More options.